“I would move to Ireland tomorrow if I could,” was the first thing my daughter said to me as she emerged from the “Arriving Passengers” doors at JFK airport last night. I was so happy to hear those words, but I knew it was more complex than that. 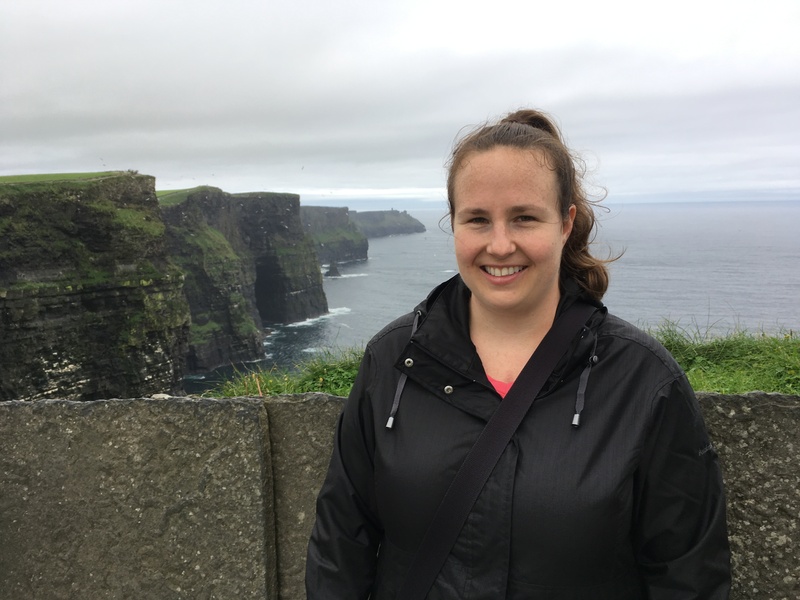 Yes, she had had an amazing time and says that Ireland is everything she hoped it would be, but she also felt sad about returning to a place she isn’t particularly fond of…Long Island…for many reasons. But before we get to those reasons, allow me to share some of the highlights of her trip as I promised you (my followers) I would. First stop: The Cliffs of Moher. The Cliffs are a phenomenal natural wonder along the central western coast of Ireland and are a must-see much like our Grand Canyon. This was her first day on the road. First Day, continued: Doolin is the town she selected to stay in overnight after her visit to the Cliffs of Moher. We thought it would be just a small stopover with not much to see. As it turned out, Monday nights are when the “locals” come out to hear traditional music, so she hit the jackpot. 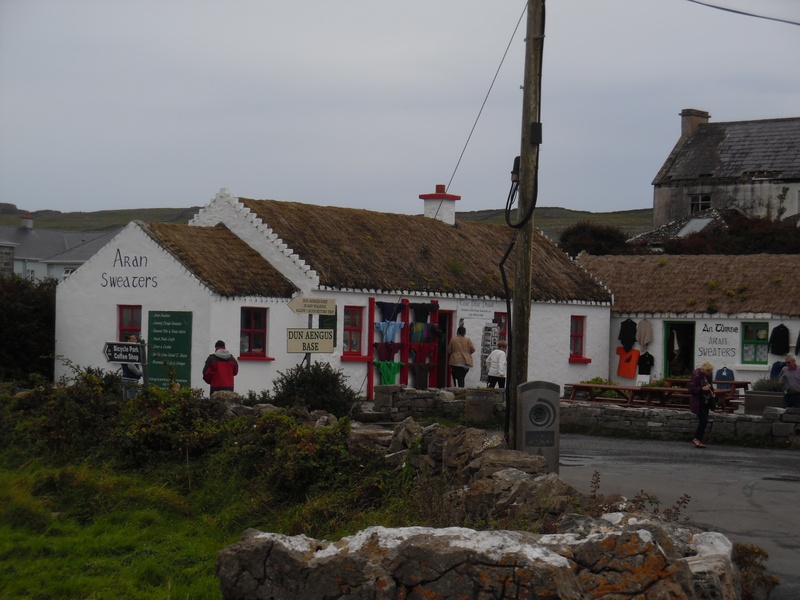 She ended up spending three nights there (because the ferry to the Aran Islands was not running one day due to inclement weather), and all three of the nights she was able to hear great Irish music in nearby pubs. 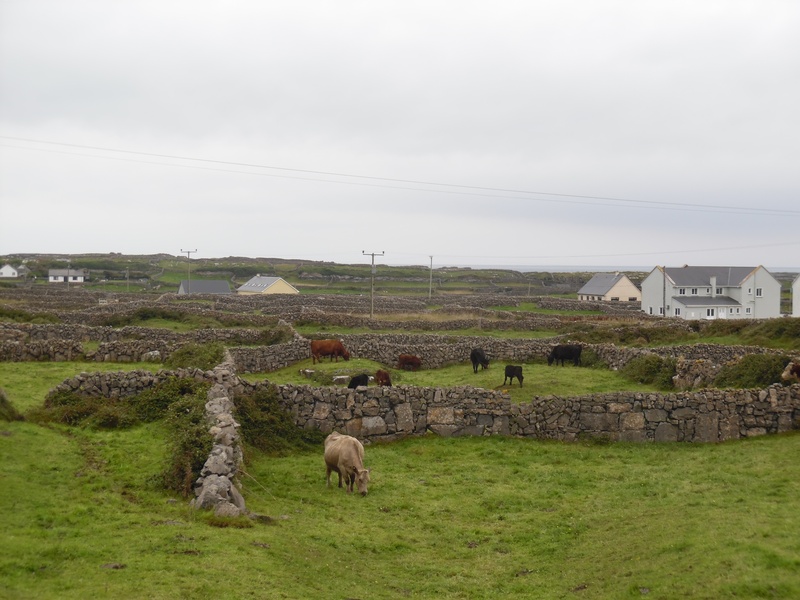 Second Day: The Aran Islands. 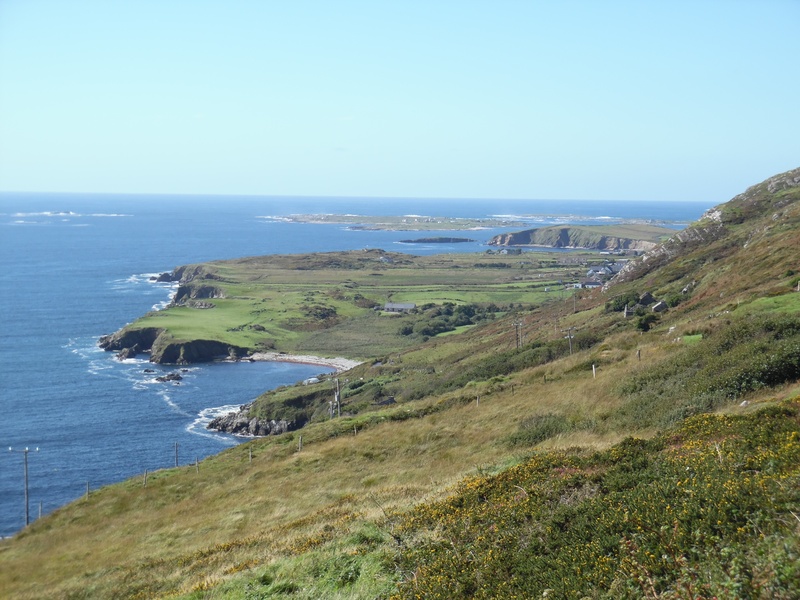 The original plan was to go to the big island, Inishmoor, spend the night there and then visit the smaller island on the return trip to Doolin. 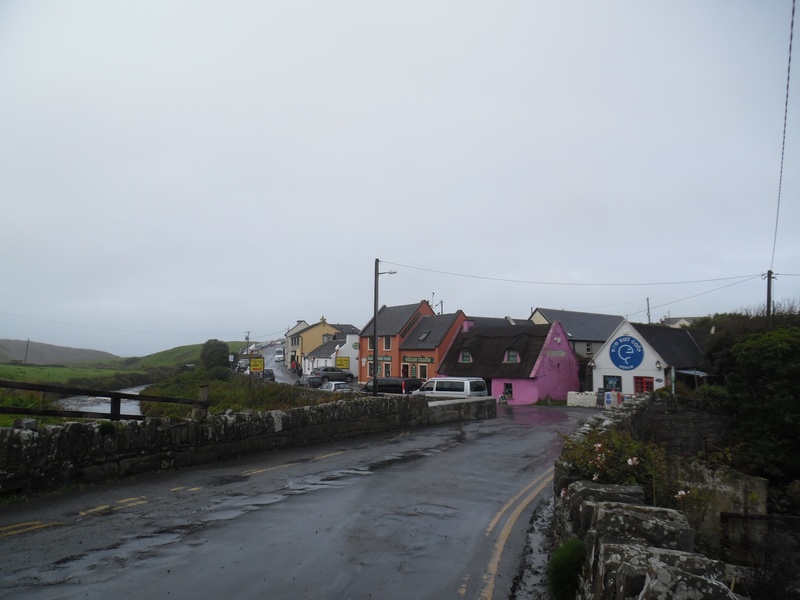 The revised plan (due to the bad weather) allowed her to spend only one night on Inishmoor and a day she spent cycling ’round the island before returning to Doolin. Fourth Day: On to Connemara. 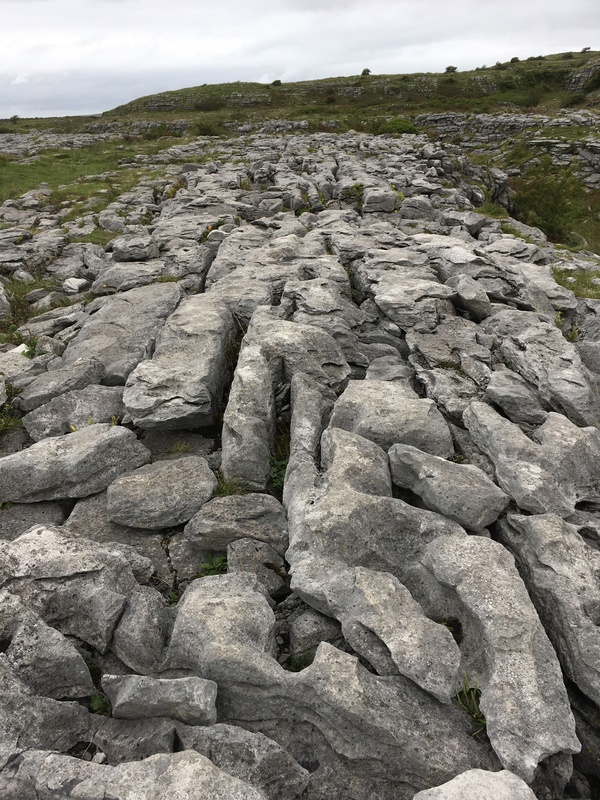 Part of the day was spent wandering around The Burren, again experiencing the rocky natural wonders of this part of the west coast. Then she continued on to the coast of Connemara on the road known as the Sky Road. She said the scenery was stunning along the way. From Connemara, which I remembered as very bucolic, green and wild, she sent a text saying, “Mom, Connemara is as beautiful as you said it would be. ” I was so relieved to know that nothing had changed and that she loved it as much as I had forty-five years ago. Once she arrived at her destination, she took the opportunity to ride a horse for the first time in her life. 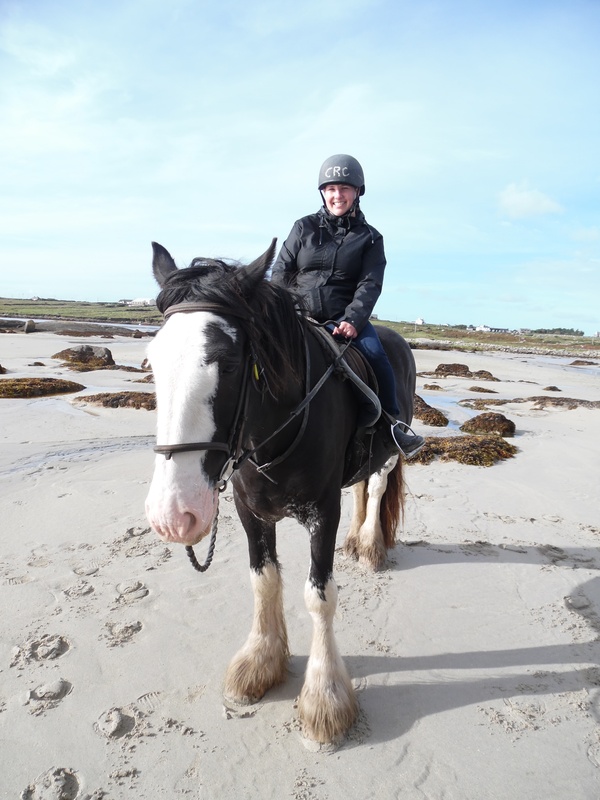 Her trusty steed was named Henry; she rode him for three hours on the beach and has the black and blue marks on her legs to prove it! Time to leave Connemarra and head to Galway where she would drop off her rental car and take the bus to Dublin. She was not enamored of the cities of Galway and Dublin, preferring the vast expanse of sky and mountains on the western coast. However, she did manage to make some planned stops in Dublin. 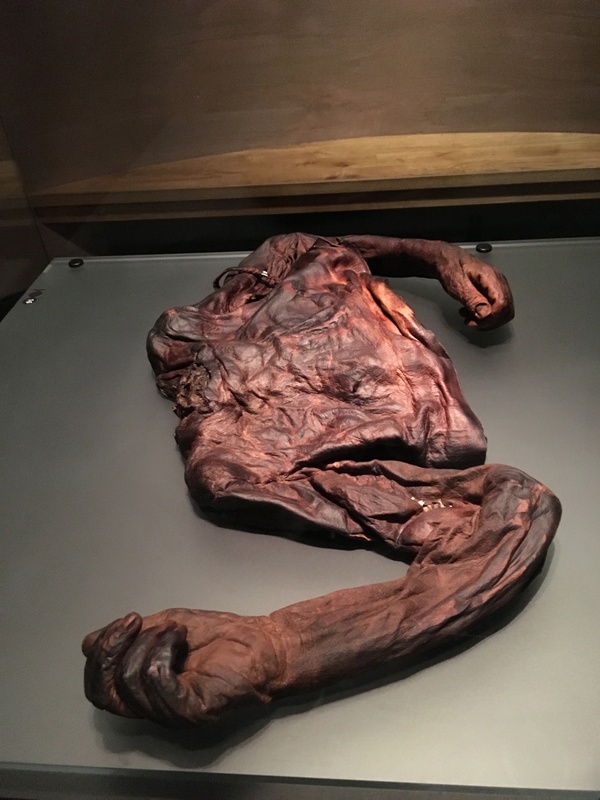 At the Museum of Archaeology in Dublin she got to see the Bog People, a people who were buried in the bogs during the Iron Age, most of whom died very violent deaths. 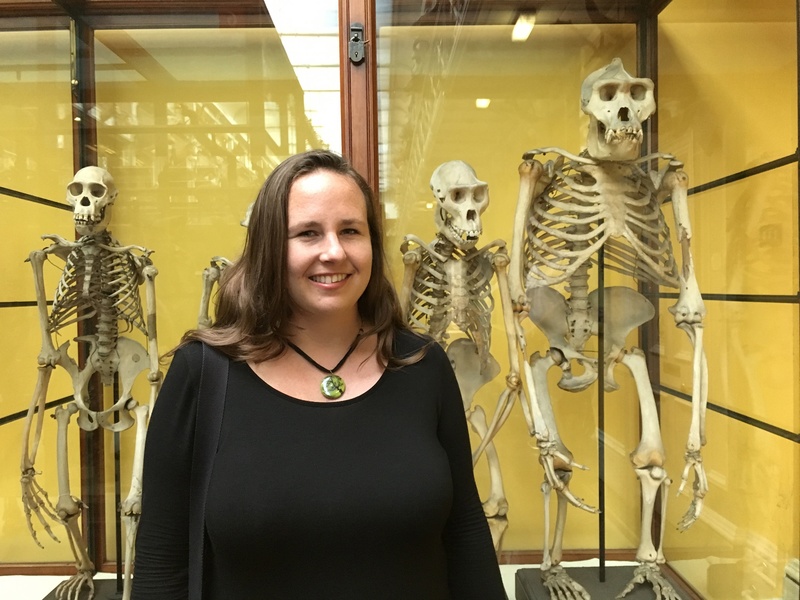 Next she visited the Museum of Natural History where she saw tons of artifacts of all types, including “her people,” the anthropoid apes. My daughter, you see, is a passionate physical anthropologist. 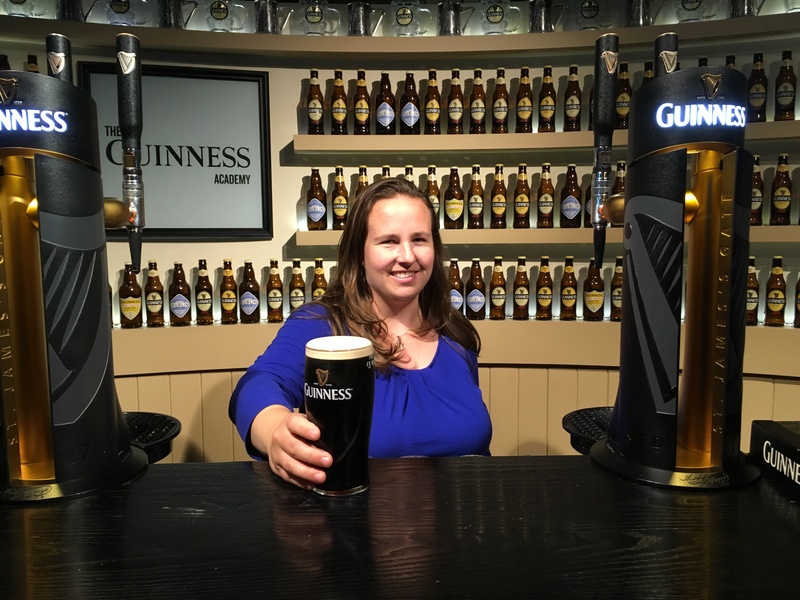 Last, but not least, a visit to the Guinness brewery which she found disappointing in its modernity and antiseptic ambiance. She did, however, enjoy a pint! All in all, she had a great trip with many great encounters and experiences. Now, about her feelings about returning home…. Long Island, you see, just doesn’t offer the access to nature that she so craves, nor the handsome lads of Ireland, nor the excellent traditional music, nor the bustling pubs,…. You get the picture. The only solution, to move there! She does look happy and at home in Ireland. 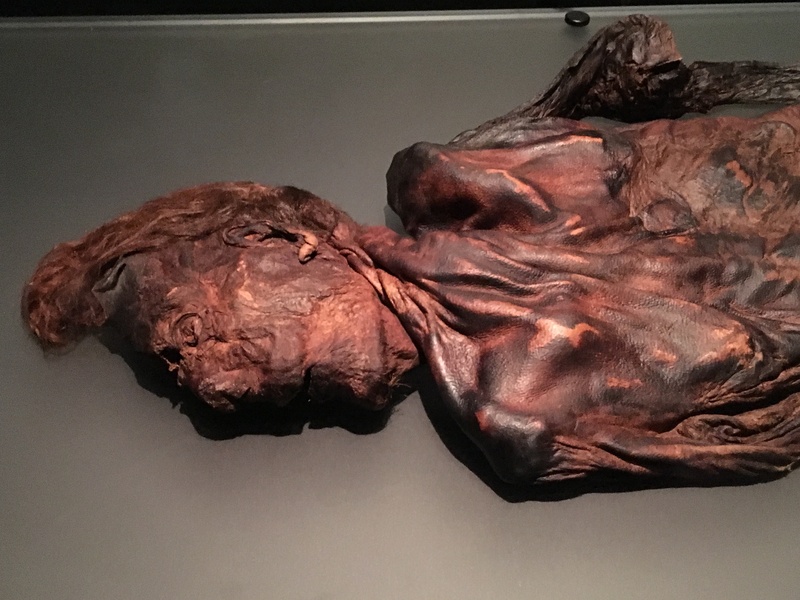 I’ve always wanted to go to Ireland and see the country without an itinerary and enjoyed reading about your daughter’s trip. That moves my trip higher up on my ‘Bucket List.’. 🙂 Thanks for sharing! Her photos and her stories made me want to go back! And I do recommend going independently so you can linger wherever you choose to do so…it’s that kind of place. But nowadays it’s kind of hard to visit without scheduling places to stay ahead of time due to high numbers of travelers. But do go! It sounds like she had a ball. Tell her to get up to Donegal, next time for it is the nicest county of all! Barbara, what a great travelogue you have presented for the reader. Having just seen the Grand Canyon yesterday has given me the intense desire to continue searching the world for phenomenons of nature. Thanks for sharing. If you and your daughter would like to offer a digital inspiration of Ireland for my summer gallery please send it on to me. The shoreline of Ireland is a lovely photo of the country’s beauty. My daughter is interested in your summer gallery. Can you send some info on how to proceed? Thanks! Love the mini tour courtesy of the photos and your narrative! So similar to many of our stops in Scotland . . .
What a great tour – she hit some amazing places to visit and make memories. What a gorgeous trip! Christine looks so happy!! Yes, she had a wonderful trip and really felt very happy in Ireland. Now she’s back to same old, same old. I feel for her. We have yet to see Ireland but a local friend is from Galway and her sister has extended the bienvenue. Soon. Don’t wait…go as soon as you can! It’s wonderful to believe there still exist places where the grass is greener. Wow I have so many similar pictures that u had ! I love Ireland too! Next Next post: What Happens When Kids Can’t Go to School?